Keratoconjunctivitis sicca, more commonly known as dry eye, is an extremely common and often unrecognized disease. It is the condition in ophthalmology that in its mild grade of severity will affect most of the population at one time or other. Due to a wide variety of presentations and symptoms, it often frustrates the ophthalmologists as well as patients. Due to multifactorial and elusive etiology, it is often challenging to treat dry eye. Ocular surface disorders are also clinically important to treat especially in terms of visual acuity. Xero-dacryology is therefore becoming a very important branch of ophthalmology. Recent studies have given insight into the inflammatory etiology of dry eye. The conventional and main approach to the treatment of dry eye is providing lubricating eye drops or tear substitutes. However, the newer treatment approach is to target the underlying cause of dry eye instead of conventional symptomatic relief. In light of the above knowledge, the present article focuses on newer theories on pathogenesis of dry eye and their impact on dry eye management. Method of Literature Search: A systematic literature review was performed using PubMed databases in two steps. The first step was oriented to articles published for dry eye. The second step was focused on the role of inflammation and anti-inflammatory therapy for dry eye. The search strategy was not limited by year of publication. A manual literature search was also undertaken from authentic reference books on ocular surface disease. Over the past few years, as a result of numerous studies, new concepts of pathogenesis have shown that dry eye seems to be caused by inflammation mediated by T-cell lymphocytes. ,, This finding has also been augmented by the studies investigating the role of antiinflammatory therapies. Consequently, because of the increasing importance of the role of inflammation in etiopathogenesis, we have included recent understanding of pathogenesis and treatment of dry eye disease (DED) in the present article. DEWS in 2007 recognized dry eye as a disturbance of the Lacrimal Functional Unit (LFU) whose parts act together and not in isolation. 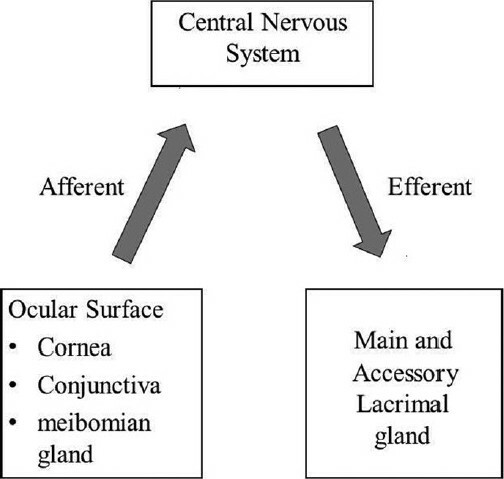 It is an integrated system comprising the lacrimal glands, ocular surface (cornea, conjunctiva and Meibomian gland More Detailss) and lids, and the sensory and motor nerves that connect them  [Figure 1]. 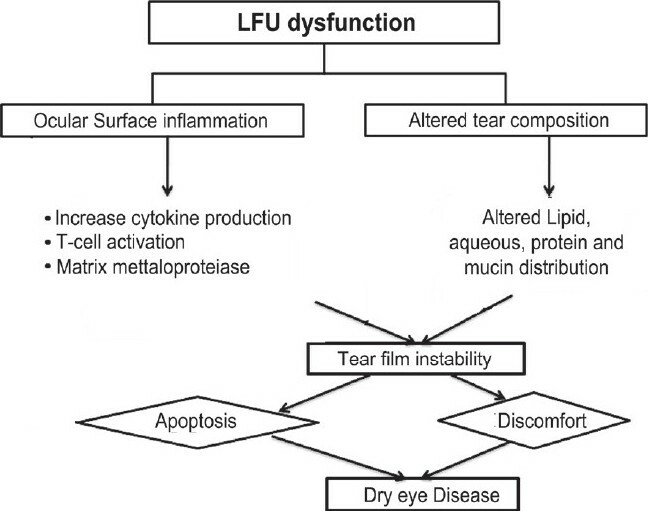 Disease or dysfunction of the lacrimal functional unit leads to changes in tear film composition and stability, which have adverse consequences for the ocular surface. Common feature of dysfunctional unit is elevated tear osmolarity. There are several reports suggesting that hyperosmolarity induces inflammation. , The role of inflammation in the etiopathogenesis of DED is briefly summarized in [Figure 3]. Thus, it can be summarized that the dysfunction of any component of lacrimal functional unit can result in unstable tear film with altered tear film composition, ocular discomfort and ocular surface disease. The end result is ocular surface inflammation starting a vicious cycle of dryness and more inflammation. Grade 1 or mild: Patients have symptoms of dryness in normal environmental conditions but no signs on slit-lamp examination. However, other electrophysiological or invasive tests, such as hyperosmolarity, hypolysozyme or inflammatory cytokines, may be positive. Grade 2 or moderate: In addition to symptoms, patient has reversible slitlamp signs such as epithelial erosion, punctate keratopathy, filamentary keratitis, short tear breakup time (TBUT), etc. Grade 3 or severe: The patient has, besides the symptoms of ocular dryness, signs that have evolved to permanent sequelae such as corneal ulcer, corneal opacity, corneal neovascularization or squamous epithelial metaplasia. These signs are commonly seen in untreated patients. Additional diagnostic tests may be performed to assess tear film instability, ocular surface damage and aqueous tear flow. As evident from pathophysiology of dry eye, many factors contribute to or exacerbate dry eye, including: tear deficiency, tear instability, irritation and inflammation. Over the past few years, as a result of numerous studies, new concepts of pathogenesis have shown that DED seems to be inflammatory in origin, mediated by Tcell lymphocytes. [3,5] This finding has also been augmented by the studies investigating the role of anti-inflammatory therapies. So, in the last few years, there has been a paradigm shift in the strategy to treat DED. However, conventional treatment still has importance. Therapy of dry eye requires a multipronged approach including tear conservation, and tear replacement through methods such as, punctual plug, novel antiinflammatory drugs and surgical procedures. Artificial tears provide temporary improvement in symptoms of eye irritation, blurred vision and visual contrast sensitivity. Artificial tears containing preservatives, particularly benzylkonium chloride, are poorly tolerated and harmful in moderate to severe cases, especially if used frequently. In this section of the review, we present uptodate antiinflammatory therapy strategies discussing both well-known and newly designed current novel medications. 1 Cyclosporine A (CsA): Several clinical studies have shown topical CsA to improve both objective and subjective sign of KCS. ,,, It is a fungal derived peptide that prevents Tcell activation and inflammatory cytokine production. It also inhibits mitochondrial mediated pathways of apoptosis. Recently, several large multicentric randomized trials confirmed the safety and efficacy of topical application of CsA for the treatment of dry eyes. It marks the first step in shifting focus of the therapy into the underlying mechanisms that contribute to the development and progression of the disease. 2 Corticosteroids: Numerous studies have concluded that topical or systemic corticosteroid therapy may have several benefits in the treatment of moderate to severe dry eyes. ,, It is very effective for achieving a quick response by nonspecifically inhibiting many aspects of the inflammatory response. However, it has to be emphasized that careful monitoring is mandatory in these cases because of steroid-related complications  like glaucoma and posterior subcapsular cataract in addition to increased chance of local infection. Punctal occlusion: One of the most useful and practical therapies for conserving tears. Purpose is to decrease physiological outflow of the tear film down the nasolacrimal system. Tarsorrhaphy and botulinum toxin induced ptosis: They decrease the palpebral aperture height, thus decreasing tear evaporation. Salivary gland transplantation: Reported to be successful in patients with severe lacrimal gland dysfunction with intact salivary function (e.g. Sjogren syndrome), radiation-induced lacrimal gland atrophy or surgical removal of lacrimal gland. Though the results appear to be promising, there is disadvantage of technical complexity and "altered" tear film consistency and composition and possibility of tear secretion during eating (i.e. crocodile tears). In conclusion, the therapy of dry eye traditionally involved hydrating and lubricating the ocular surface, which may provide temporary improvement in symptoms of irritation and blurred vision, but did not address the inflammation that is the underlying cause of dry eye. New insights into the inflammatory nature of this disease have led to a paradigm shift in the therapeutic approach to KCS. In particular, treatment is now directed more toward suppressing the inflammatory response on the ocular surface. 1. O'Brien PD, Collum LM. Dry eye: Diagnosis and current treatment strategies. Curr Allergy Asthma Rep 2004;4:314-9. 2. The definition and classification of dry eye disease: Report of the Definition and Classification Subcommittee of the International Dry Eye Workshop (2007). Ocul Surf 2007;5:75-92. 3. Gao J, Schwalb TA, Addeo JV, Ghosn CR, Stern ME. The role of apoptosis in the pathogenesis of canine keratoconjunctivitis sicca: The effect of topical cyclosporine A therapy. Cornea 1998;17:654-63. 4. Kunert KS, Tisdale AS, Stern ME, Smith JA, Gipson IK. Analysis of topical cyclosporine treatment of patients with dry eye syndrome: Effect on conjunctival lymphocytes. Arch Ophthalmol 2000;118:1489-96. 5. Stern ME, Gao J, Schwalb TA, Ngo M, Tieu DD, Chan CC, et al. Conjunctival T-cell subpopulations in Sjögren's and non- Sjögren's patients with dry eye. Invest Ophthalmol Vis Sci 2002;43:2609-14. 6. Pflugfelder SC. The Lacrimal Functional Unit. In: Pflugflelder SC, Roger WB, editors. Dry eye and Ocular Surface disorders. New York: Marcel Dekker; 2004. p. 11-32. 7. Gayton JL. Etiology, prevalence and treatment of dry eye disease. Clin Ophthalmol 2009;3:405-12. 8. Stern ME, Beuerman RW, Fox RI, Gao J, Mircheff AK, Pflugfelder SC. A unified theory of the role of the ocular surface in dry eye. Adv Exp Med Biol 1998;438:643-51. 9. The epidemiology of dry eye disease: Report of the Epidemiology Subcommittee of the International Dry Eye Workshop (2007). Ocul Surf 2007;5:93-107. 10. Lambert DW, Foster CS, Perry HD. Schirmer test after topical anesthesia and the tear meniscus height in normal eyes. Arch Ophthalmol 1979;97:1082-5. 11. Connor CG, Flockencier LL, Hall CW. The influence of gender on the ocular surface. J Am Optom Assoc 1999;70:182-6. 12. Krenzer KL, Dana MR, Ullman MD, Cermak JM, Tolls DB, Evans JE, et al. Effect of androgen deficiency on the human meibomian gland and ocular surface. J Clin Endocrinol Metab 2000;85:4874-82. 13. Schaumberg DA, Buring JE, Sullivan DA. Hormone replacement therapy and dry eye syndrome. JAMA 2001;286:2114-9. 14. Ang RT, Dartt DA, Tsubota K. Dry eye after refractive surgery. Curr Opin Ophthalmol 2001;12:318-22. 15. Donnenfeld ED, Ehrenhaus M, Solomon R, Mazurek J, Rozell JC, Perry HD. Effect of hinge width on corneal sensation and dry eye after laser in situ keratomileusis. J Cataract Refract Surg 2004;30:790-7. 16. Lee AJ, Lee J, Saw SM, Gazzard G, Koh D, Widjaja D, et al. Prevalence and risk factors associated with dry eye symptoms: A population based study in Indonesia. Br J Ophthalmol 2002;86:1347-51. 17. Schlote T, Kadner G, Frudenthaler N. Marked reduction and distinct pattern of eye blinking in patients with moderately dry eyes during video display terminal use. Graefes Arch Clin Exp Ophthalmol 2004;242:306-12. 18. Blehm C, Vishnu S, Khattak A, Mitra S, Yee RW. Computer vision syndrome: A review. Surv Ophthalmol 2005;50:253-62. 19. Wolkoff P, Nøjaard JK, Troiano P, Piccoli B. Eye complaints in the office environment: Precorneal tear film integrity influenced by eye blinking efficiency. Occup Environ Med 2005;62:4-12. 20. Wolkoff P, Nøjaard JK, Franck C, Skov P. The modern office environments desiccate the eye? Indoor Air 2006;16:258-65. 21. Management and therapy of dry eye disease: Report of the Management and Therapy Subcommittee of the International Dry Eye WorkShop (2007). Ocul Surf 2007;5:163-78. 22. Corrales RM, Villarreal A, Farley W, Stern ME, Li DQ, Pflugfelder SC. Strain-related cytokine profiles on the murine ocular surface in response to desiccating stress. Cornea 2007;26:579-84. 23. Li DQ, Pflugfelder SC. Matrix metalloproteinases in corneal inflammation. Ocul Surf 2005;3(4 Suppl):S198-202. 24. Gumus K, Cavanagh DH. The role of inflammation and antiinflammation therapies in keratoconjunctivitis sicca. Clin Ophthalmol 2009;3:57-67. 25. Djalilian AR, Pedram H, Pflugfelder SC. Dry Eye. In: Krachmer, Mannis, Holland, editors. Cornea, Vol 1, 2 nd ed. Philadeiphia: Elsevier; 2005. p. 521-38. 26. Dana MR, Hamarah P. Role of immunity and inflammation in corneal and ocular surface disease associated with dry eye. Adv Exp Med Biol 2002;506:729-38. 27. Hamarah P, Haq SO, Gulati A, Dana MR. Mechanism of ocular surface immune response. In: Pflugflelder SC, Roger W.B, editors. Dry eye and Ocular Surface disorders. New York: Marcel Dekker; 2004. p. 111-41. 28. Zoukhri D. Effect of inflammation on lacrimal gland function. Exp Eye Res 2006;82:885-98. 29. Zhu Z, Stevenson D, Ritter T, Schechter JE, Mircheff AK, Kaslow HR, et al. Expression of IL-10 and TNF-inhibitor genes in lacrimal gland epithelial cells suppresses their ability to activate lymphocytes. Cornea 2002;21:210-4. 30. Brignole F, De Saint Jean M, Goldschild M, Becquet F, Goguel A, Baudouin C. Expression of the fas-fas ligand antigens and appropriate marker apo2.7 by the human conjunctival epithelium. Positive correlation with class II HL-DR expression in inflammatory ocular surface disorders. Exp Eye Res 1998;67:687-97. 31. Farris RL. Tear osmolarity- a new gold standard? Adv Exp Med Biol 1994;350:495-503. 32. Schwartz L, Guais A, Pooya M, Abolhassani M. Is inflammation a consequence of extracellular hyperosmolarity? J Inflamm (Lond) 2009;23:21. 33. Mircheff AK. Hormonal support of lacrimal function, primary lacrimal deficiency, autoimmunity and peripheral tolerance in the lacrimal gland. Ocul Immunol Inflamm 1996;4:145-52. 34. Azzarolo AM, Mircheff AK, Kaswan RL, Stanczyk FZ, Gentschein E, Becker L, et al. Androgen support of lacrimal gland function. Endocrine 1997;6:39-45. 35. Danjo Y, Watanabe H, Tisdale AS, George M, Tsumura T, Abelson MB, et al. Alteration of mucin in human conjunctival epithelia in dry eye. Invest Ophthalmol Vis Sci 1998;39:2602-9. 36. Methodologies to diagnose and monitor dry eye disease: Report of the Diagnostic Methodology Subcommittee of the International Dry Eye WorkShop (2007). Ocul Surf 2007;5:108-52. 37. Perry HD. Dry Eye Disease: Pathophysiology, classification, and diagnosis. Am J Manag Care 2008;14(3 Suppl):S79-87. 38. Cintia S, DE Pavia, Pflugfelder SC. Diagnostic approaches to lacrimal keratoconjunctivitis. In: Pflugfelder SC, editors. Dry eye and ocular surface disorders. New York: Marcel Dekker; 2004. p. 270. 39. Perry HD, Donnenfeld ED. Dry eye diagnosis and management in 2004. Curr Opin Ophthalmol 2004;15:299-304. 40. Meyer D. Diagnostic tests and principles in dry eye syndrome. In: Garg A, editor. Clinical diagnosis and management of dry eye and ocular surface disorders (Xero-Dacryology). 1 st ed. New Delhi: Jaypee; 2006. p. 65-82. 41. 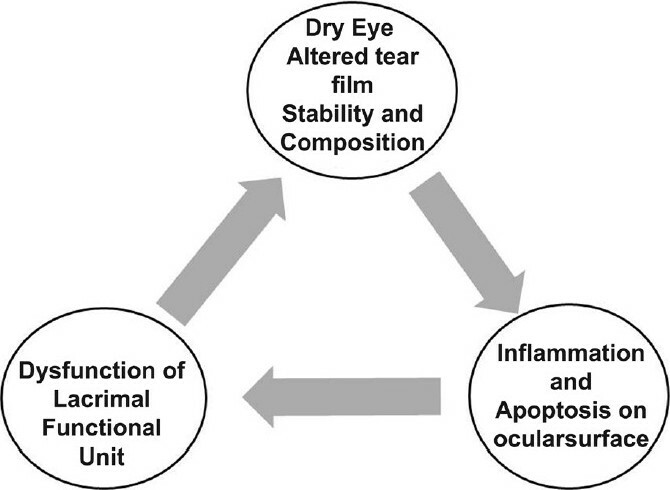 Murube J, Nemeth J, Hoh H. The triple classification of dry eye for practical clinical use. In: Garg A, editor. Clinical diagnosis and management of dry eye and ocular surface disorders (Xero- Dacryology). 1 st ed. New Delhi: Jaypee; 2006. p. 45-59. 42. Yokoi N, Komuro A. Non-invasive methods of assessing the tear film. Exp Eye Res 2004;78:399-407. 43. Van Bijsterveld OP. Diagnostic test in sicca syndrome. Arch Ophthalmol 1969;82:10-4. 44. Afonso AA, Monroy D, Stern ME, Feuer WJ, Tseng SC, Pflugfelder SC. Correlation of tear fluorescein clearance and Schirmer test scores with ocular irritation symptoms. Ophthalmology 1999;106:803-10. 45. De Paiva CS, Lindsey JL, Pflugfelder SC. Assessing the severity of keratitis sicca with videokeratoscopic indices. Ophthalmology 2003;110:1102-9. 46. Huang FC, Tseng SH, Shih MH, Chen FK. Effect of artificial tears on corneal surface regularity, contrast sensitivity, and glare disability in dry eyes. Ophthalmology 2002;109:1934-40. 47. Calonge M, Diebold Y, Saez V, Enríquez de Salamanca A, García-Vázquez C, Corrales RM, et al. Impression cytology of the ocular surface: A review. Exp Eye Res 2004;78:457-72. 48. Tomlinson A, Khanal S, Ramaesh K, Diaper D, McFadyen A. Tear Film Osmolarity: Determination of a Referent for dry eye diagnosis. Invest Ophthalmol Vis Sci 2006;47:4309-15. 49. Tsubota K, Yamada M, Urayama K. Spectacle side panels and moist inserts for the treatment of dry-eye patients. Cornea 1994;13:197-201. 50. Pflugfelder SC, Stern ME. Therapy of Lacrimal Keratoconjunctivitis. In: Pflugflelder SC, Roger WB, editors. Dry eye and ocular surface disorders. New York: Marcel Dekker; 2004. p. 309-20. 51. American Academy of Ophthalmology. Punctal occlusion for the dry eye. Three-year revision. ophthalmic procedure assessment. Ophthalmology 1997;104:1521-4. 52. Awan KJ. Laser punctoplasty for the treatment of punctual stenosis. Am J Ophthalmol 1985;100:341-2. 53. Lemp MA. Artificial tear solutions. Int Ophthalmol Clin 1973;13:221-9. 54. Haung FC, Tseng SH, Shih MH, Chen FK. Effect of artificial tears on corneal surface regularity, contrast sensitivity and glare disability in dry eyes. Ophthalmology 2002;109:1934-40. 55. Kymionis GD, Bouzoukis DI, Diakonis VF, Siganos C. Treatment of chronic dry eye: Focus on cyclosporine. Clin Ophthalmol 2008;2 Suppl 4:829-36. 56. Gunduz K, Ozdemir O. Topical cyclosporin treatment of keratoconjunctivitis sicca in secondary Sjögren's syndrome. Acta Ophthalmol (Copenh) 1994;72:438-42. 57. Sall KN, Cohen SM, Christensen MT, Stein JM. An evaluation of the efficacy of a cyclosporine-based dry eye therapy when used with marketed artificial tears as supportive therapy in dry eye. Eye Contact Lens 2006;32:21-6. 58. Salib GM, McDonald MB, Smolek M. Safety and efficacy of cyclosporine 0.05% drops versus unpreserved artificial tears in dry-eye patients having laser in situ keratomileusis. J Cataract Refract Surg 2006;32:772-8. 59. Sall K, Stevenson OD, Mundorf TK, Reis BL. Two multicenter, randomized studies of the efficacy and safety of cyclosporine ophthalmic emulsion in moderate to severe dry eye disease. CsA Phase 3 Study Group. Ophthalmology 2000;107:631-9. 60. Matsuda S, Koyasu S. Mechanism of action of cyclosporine. Immunopharmacology 2000;47:119-25. 61. Sjogren H. Keratoconjunctvitis sicca. In: Ridly F, Sorsby A, editors. Modern Trends in Ophthalmology. London: Butterworth; 1940. p. 403-13. 62. Marsh P, Pflugfelder SC. Topical nonpreserved methylprednisolone therapy for keratoconjunctivitis sicca in Sjögren syndrome. Ophthalmology 1999;106:811-6. 63. Hong S, Kim T, Chung SH, Kim EK, Seo KY. Recurrence after topical nonpreserved methylprednisolone therapy for keratoconjunctivitis sicca in Sjögren's syndrome. J Ocul Pharmacol Ther 2007;23:78-82. 64. Pflugfelder SC. Antiinflammatory therapy for dry eye. Am J Ophthalmol 2004;137:337-42. 65. Rosenberg ES, Asbell PA. Essential fatty acids in the treatment of dry eye. Ocul Surf 2010;8 Suppl 1:18-28. 66. Barabino S, Roland M, Camicione P, Ravera G, Zanardi S, Giuffrida S, et al. Systemic linoleic acid and gamma linolenic acid therapy in dry eye syndrome with an anti-inflammatory component. Cornea 2003;22:97-101. 67. Aragona P, Bucolo C, Spinella R, Giuffrida S, Ferreri G. Systemic omega-6 essential fatty acid treatment and pge1 tear content in Sjögren's syndrome patients. Invest Ophthalmol Vis Sci 2005;46:4474-9. 68. Roncone M, Bartlett H, Eperjesi F. Essential fatty acids for dry eye: A review. Cont Lens Anterior Eye 2010; 33 Suppl 2:49-54; quiz 100. 69. Hayashi Y, Ishimaru N, Arakaki R, Tsukumo S, Fukui H, Kishihara K, et al. Effective treatment of a mouse model of Sjögren's syndrome with eyedrop administration of anti-CD4 monoclonal antibody. Arthritis Rheum 2004;50:2903-10. 70. Fox RI, Dixon R, Guarrasi V, Krubel S. Treatment of primary Sjögren's syndrome with hydroxychloroquine: A retrospective, open-label study. Lupus 1996;5 Suppl 1:S31-6. 71. Yavuz S, Asfuroðlu E, Bicakcigil M, Toker E. Hydroxychloroquine improves dry eye symptoms of patients with primary Sjogren's syndrome. Rheumatol Int 2010 [In press]. 72. Seo MJ, Kim JM, Lee MJ, Sohn YS, Kang KK, Yoo M. The therapeutic effect of DA-6034 on ocular inflammation via suppression of MMP-9 and inflammatory cytokines and activation of the MAPK signaling pathway in an exp erimental dry eye model. Curr Eye Res 2010;35 Suppl 2:165-75. 73. Garg A. In: Garg A, editor. Clinical diagnosis and management of dry eye and ocular surface disorders (Xero-Decryology). New Delhi: Jaypee; 2006. p. 99. 74. Ono M, Takamura E, Shinozaki K, Tsumura T, Hamano T, Yagi Y, Tsubota K. Therapeutic effect of cevimeline on dry eye in patients with Sjögren's syndrome: A randomized, double-blind clinical study. Am J Ophthalmol 2004;138 Suppl 1:6-17. 75. Avni I, Garzozi HJ, Barequet IS, Segev F, Varssano D, Sartani G, et al. Treatment of Dry Eye Syndrome with Orally Administered CF101 Data from a Phase 2 Clinical Trial. Ophthalmology 2010;117:1287-93. 76. Lee MS, Shin BC, Choi TY, Ernst E. Acupuncture for treating dry eye: A systematic review. Acta Ophthalmol 2011;89:101-6.